The Minnesota Timberwolves are 4-15, which is not the worst record in their division, but it's far from the best. Obviously, Vice President of Basketball Operations Kevin McHale will not tolerate such underachievement, so he has rightly fired head coach Randy Wittman and replaced him with the only man fit to order this team around the floor—himself. That's right. Kevin McHale apparently got tired of Matt Millen taking all his "worst GM in history" thunder, and now that Millen is out of the picture, he's seizing the opportunity to take Minnesota's futility to hilarious new heights. 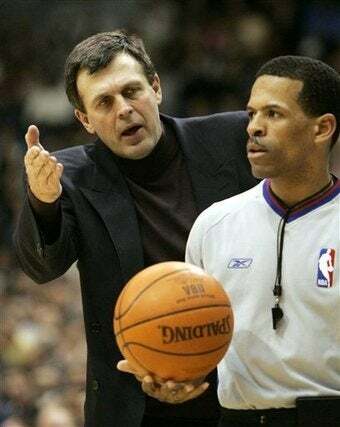 McHale actually ran the show once before, playing out the string after firing Flip Saunders towards the end of '05 and acquitted himself well, with a 19-12 record. Of course, that team still had Kevin Garnett and was not (quite as) laughably bad as this one. This is the 14th season that McHale has had his job. Fourteen. From one Lions fan to the Minny faithful, I can only say, "This too shall pass. It's got to, right?"